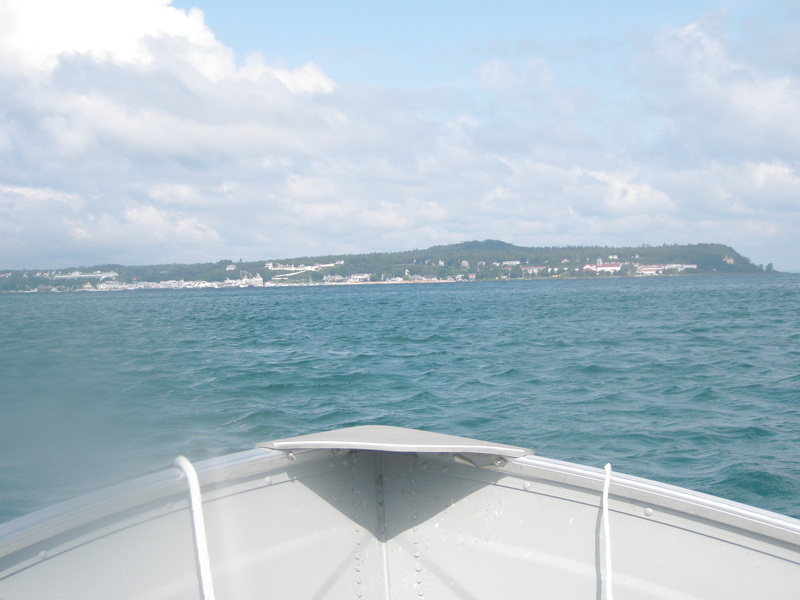 My uncle’s piloting the family motor boat into Mackinac. Mackinac is another weirdly pronounced island name like Bois Blanc (Bob-lo). Mackinac is pronounced Mackinaw. Mackinac Island was the original tourist location in Northern Michigan before Bois Blanc Island and it still attracts thousands of people per day. 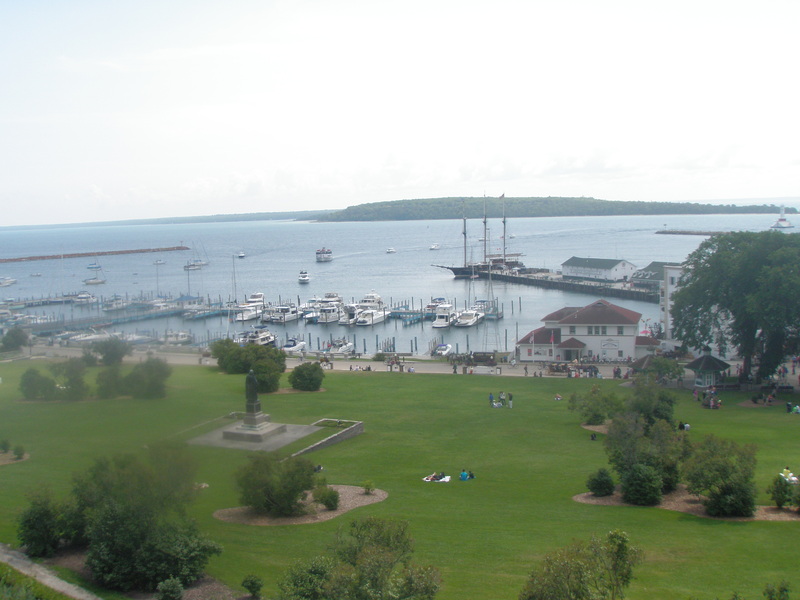 Initially, Mackinac Island was a trading post for the local Ojibwa Native Americans. They brought furs to trade with European settlers. The Europeans then took the furs east and sold them. The traders chose Mackinac to conduct business because it is well situated at the junction between Lake Michigan and Lake Huron. People could easily reach Mackinac by boat from all over the Northwest Territory. Twice a year there is a big sailing contest that fills the port up with colorful sails. Didn’t catch the contest this year though. Since Mackinac was the center of this trade it was important for the British to defend it. 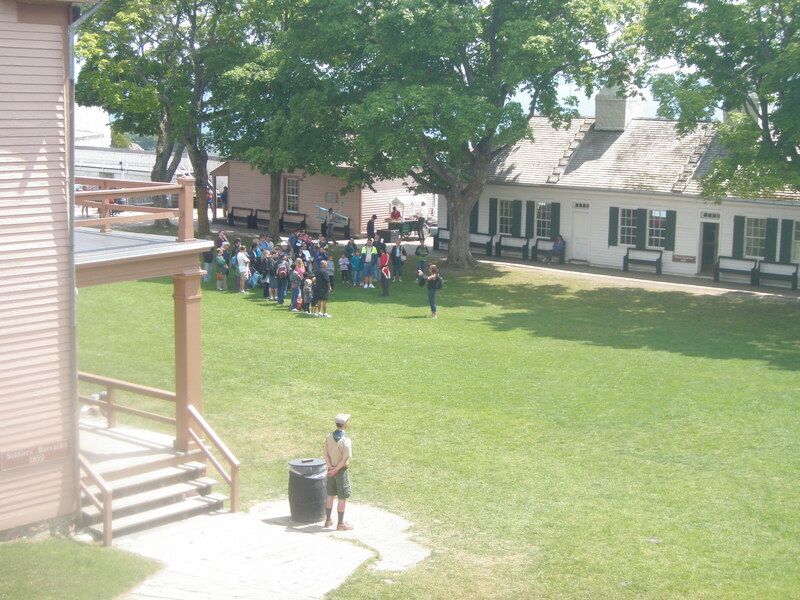 The British built Fort Mackinac on the south side of the island to protect and control the fur trade. As the fur trade died out it became replaced by tourism in the late 1800s. Millions of people visit Mackinac Island every year, but what do they all do there? There are gift shops, arcades, toy stores, fudge shops (Mackinac Island fudge is the best in the world), and tons of state park space to explore. Fort Mackinac is now a historical site where costumed employees will tell you what life on the frontier was like in the 1800s. There’s a soldier down on the parade grounds giving a history lesson to some other tourists. There are a few other historical buildings sprinkled around the island including an old doctor’s house and a beautiful church. 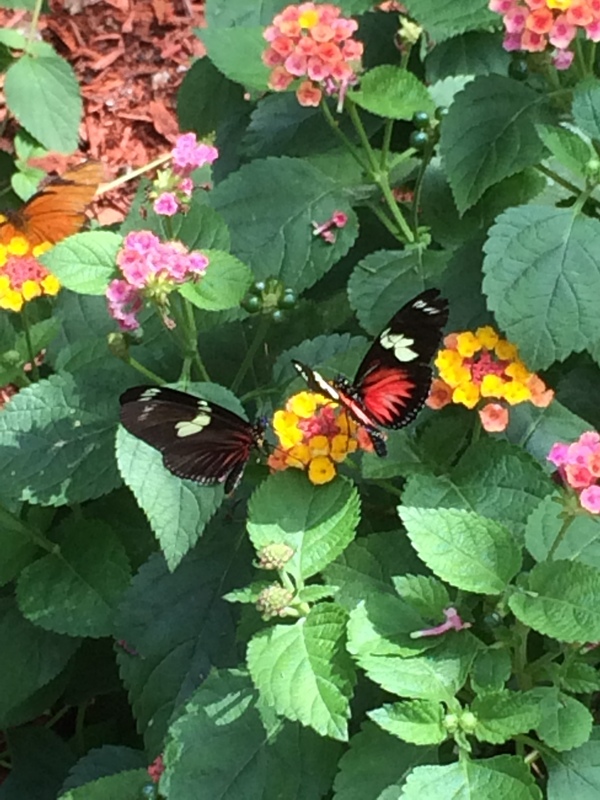 My favorite attraction on Mackinac is the Butterfly House. It’s a little house on the hill behind the beautiful church. The house connects to a greenhouse filled with hundreds of butterflies from all over the world. The butterflies flap around and land on flowers and people who are sitting still while instrumental music plays through overhead speakers. A picture doesn’t really capture the whole experience, but here’s one of my better ones when a butterfly landed on a flower. So pretty! These two were chasing each other around the house before landing here. It’s like stepping into a greenhouse full of flowers, only the flowers are flying around over your head, dancing. My wife and I got some delicious Mackinac Island fudge before being picked up by my uncle in the family motor boat for the return trip to Bois Blanc Island.